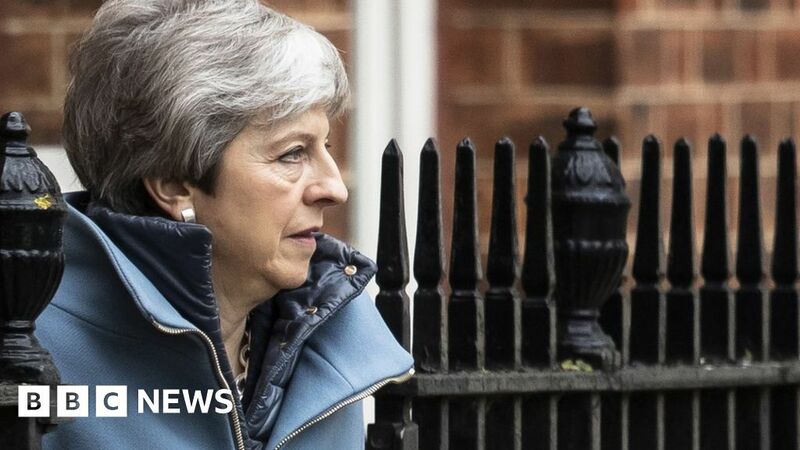 Theresa May has told MPs that a third vote on her Brexit deal may not take place next week “if it appears there is not sufficient support”. It comes after European Council President Donald Tusk said Brexit’s fate was “in Britain’s hands”. EU leaders have agreed to delay the departure date by at least two weeks. If MPs approve the PM’s deal next week, Brexit would be delayed from 29 March until 22 May. Otherwise the UK has until 12 April to propose a new plan. That was one of four “clear choices” she outlined, along with revoking Article 50 which she says would “betray the result of the referendum”, leaving with no deal, or getting her deal approved next week. The final option relies on Commons Speaker John Bercow allowing her to bring the deal back after he previously ruled that another vote couldn’t be held without “substantial” changes to the deal. She offered to talk to MPs over the coming days “as Parliament prepares to take momentous decisions”. Mrs May also referred to her televised address on Wednesday, in which she blamed the delay to Brexit on MPs. She acknowledged that “a number of colleagues had raised concerns” about her words and it had not been her intention to make their “difficult job… any more difficult”. In the letter, Mrs May confirmed that the government would change the law to alter the UK’s departure date from the EU next week. Theresa May’s admission that there may not be a third vote on her deal after all will focus minds on what an alternative plan might be. To avoid asking the EU for a longer extension and holding European parliament elections, the Prime Minister will need a new course of action. A series of indicative votes in parliament looks the most likely way to decide that – but there is no agreement on whether the government should lead that process or relinquish control to parliament. And when and if a consensus in parliament emerges, there is no guarantee it will automatically become government policy. It has taken two years for the government to formulate, negotiate and attempt to get a Brexit deal through parliament. Finding an alternative which ministers, MPs and the EU are happy to embrace within the next two weeks will be a very tough task indeed. Speaking in Brussels on Friday, Mr Tusk said that until 12 April, “anything is possible” including a much longer delay or cancelling Brexit altogether. He said he was “really happy” the 27 EU leaders had reached a unanimous decision to extend the two-year Article 50 process, under which the UK was due to leave the EU on 29 March. “It means that until 12 April, anything is possible: a deal, a long extension if the United Kingdom decided to rethink its strategy, or revoking Article 50, which is a prerogative of the UK government. According to the final summit conclusions, the UK is expected to “indicate a way forward” before 12 April, if MPs do not approve the withdrawal deal negotiated with the EU, which would then be considered by the European Council. The UK must decide by then whether it will take part in European Parliamentary elections from 23-26 May – if it does not, then a long delay would become “impossible”, Mr Tusk said. Nigel Dodds, deputy leader of the DUP – whose votes Mrs May relies on to support her minority government – said the prime minister had “missed an opportunity” to propose changes to the withdrawal agreement to help get it through the Commons. On Friday, Mrs May’s deputy David Lidington met opposition parties to discuss how MPs could vote on alternatives to the government’s Brexit plan next week. These could include options such as holding another referendum, leaving with no deal or pursuing a closer economic arrangement such as the “Common Market 2.0” plan. Labour leader Jeremy Corbyn, who wants his alternative plan for a customs union and guarantees on workers’ rights to be among those voted on, said there was support for a different way forward.